Play poker, support the kids, and buy your 2018 Poker Night ticket! Piedmont friends! This is the tenth year of our signature event, and we are going “All In for the Kids”. That means three things. One, it’s all about Poker – nothing else. Two, we lied; it’s not just about the poker. We’ll have a Cigar Bar (no smoking indoors), Top Dog, and a small bite of Wagyu/Caviar (sponsored by a local caviar company). Third, cocktails, keg and wine will be served. We good? Remember, all net proceeds will go to benefit Havens Elementary! 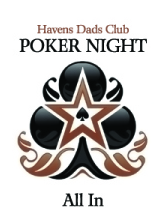 The first hand for the poker tournament will be dealt around 6:30 p.m. Please buy tickets in advance for this important fundraiser (and really fun night) through the following link: 2018 Poker Night. Don’t miss this fabulous fundraiser supporting Havens! Win the annual champion bracelet!